We seek more information from press reports about the suicide of Rudolf Swiderski, at the age of 31, in Leipzig in August 1909. The final game of Swiderski’s life (a draw against G. Enderlein in a tournament in Leipzig on 30 July 1909) was published on pages 301-302 of Deutsches Wochenschach, 29 August 1909. 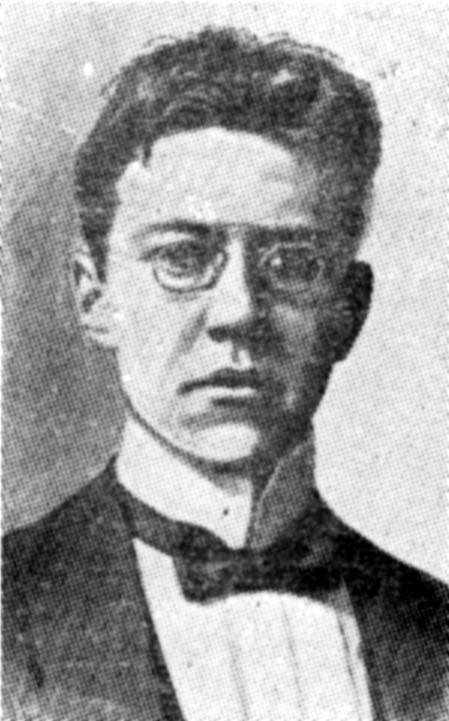 A curiosity reported by the same magazine (14 November 1909 issue, page 402) is that because Swiderski died before the event (a club tournament) finished, he was not regarded as the first prize winner, despite having the highest score. 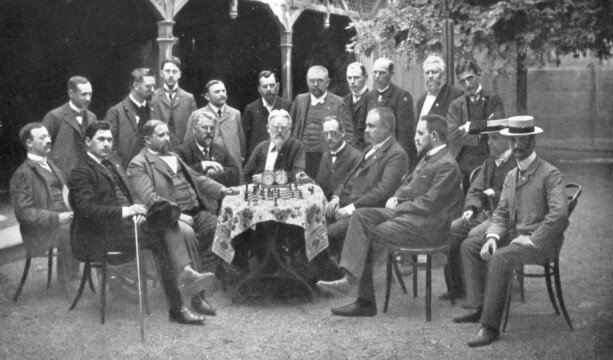 Standing (left to right): C. Schlechter, H. Ranneforth, R. Swiderski, C. Schröder, A. Schott, F. Tausch, W. John, H. Süchting, C. Teller, L. Fleischmann. Seated: J. Mieses, H. Wolf, H. von Gottschall, P. Schellenberg, R. Gebhardt, J. Berger, G. Marco, O. Bernstein, C. von Bardeleben, H. Caro. 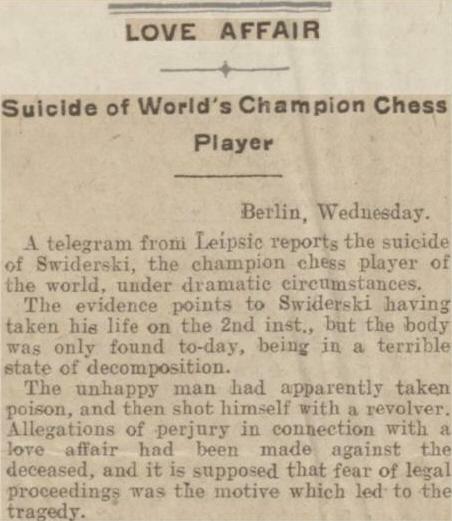 ‘Famous Chess Player a Suicide. 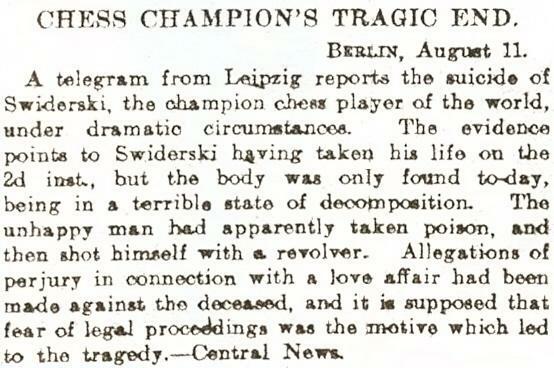 Of course, such a lamentable affair cannot be left with an ‘apparently’, but there is in any case a major discrepancy which will, we hope, now prompt a reader in Germany to investigate what appeared in the local press: if Swiderski died on 12 August (as chess reference books affirm), how could the despatch from Berlin be dated 11 August? 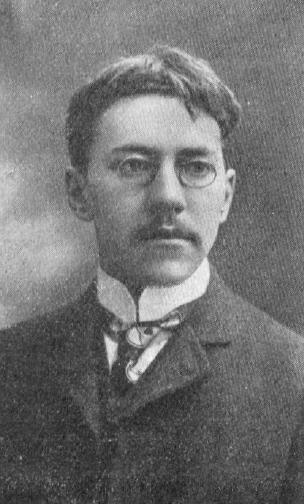 Deutsches Wochenschach (15 August 1909, pages 285-286) gave no exact date, merely stating that he had died suddenly in the past week. Deutsche Schachblätter (15 August 1909, page 56) accorded Swiderski’s death five lines, reporting that he had died suddenly in his 31st year. Nor was a date specified by L. Bachmann is his obituary of Swiderski on page 194 of Schachjahrbuch für 1909 (Ansbach, 1909). The Wiener Schachzeitung (October 1909, pages 351-352) printed an impossible date of death (2 September), whereas the American Chess Bulletin (October 1909, page 227) put 2 August. Of the reports currently known to us, only the Washington Post indicated, speculatively, the cause of death (i.e. the unusual combination of poisoning and shooting). 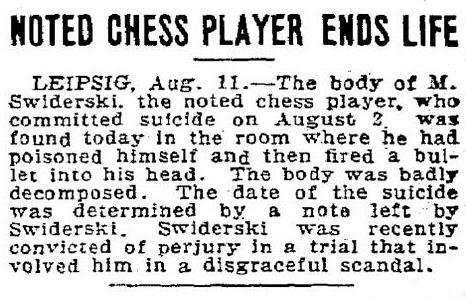 Moreover, it stated that on 11 August Swiderski was ‘found dead’, which does not necessarily mean that he died that day. C.N. 3654 asked, unavailingly, if a reader in Germany could investigate what appeared in the local press, and there is now all the more reason to do so. Latest update: 16 April 2012.